The really exciting thing isn't that PCI Express slot, it's the Creative 'CA0106-DAT' chipset which forms the backbone of a Creative Audigy SE 7.1 hardware soundcard system. For anyone really concerned with good high quality sound that does sap CPU cycles, this is nice bonus from the standard AC'97 software codec/controller and on par with Intel's High Definition Azailia sound system. With the K8N Diamond Plus motherboard, users really have no reason to buy another hardware soundcard! The Audigy SE soundcard supports 24-bit audio with 96KHz audio quality, 100dB SNR clarity and is Dolby Digital ready. 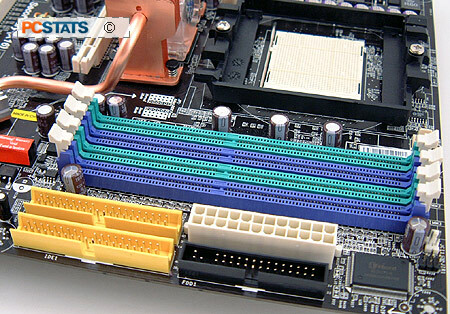 Please note the power supply requirements of the MSI K8N Diamond Plus motherboard involve both a 24-pin ATX and 8-pin 12V auxiliary connector. The current crop of high performance SLI motherboard draw a lot of electricity, and it's always advisable to have a recent power supply in the case instead of recycling that old 20-pin ATX unit from years past. This is especially true if your system is going to be operating with twin SLI videocards. The MSI K8N Diamond Plus requires a native 24-pin power supply (450W or greater), so if you're upgrading a PC with an older 20-pin PSU, you will have to get a newer unit. This 510W model which we recommend from PC Power and Cooling is a good candidate. 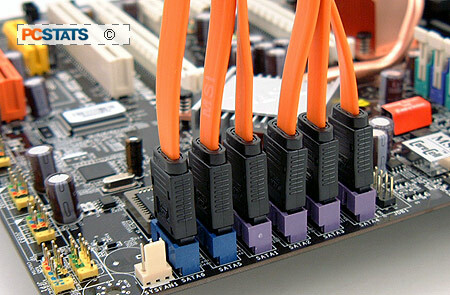 The motherboard is also equipped with an eight pin ATX12V connector, and on this line the power supply should be capable of delivering at lest 18 Amps. The 4-pin molex connect right next to the first PCI Express slot is for delivering power directly to that videocard. This connector is not entirely necessary, but it's worth connecting up if you are experimenting with overclocking. The K8N Diamond Plus is equiped with a PCI Express x1-based Silicon Image SiI3132 Serial ATA II RAID controller, which is tied into the bottom two blue SATA-2 headers. The nForce 4 SLI chipset handles the other four SATA headers via the PCI bus, and these offer up the potential of RAID 0, 1, 0+1, 5 based on nVidia's MediaShield feature. The Silicon Image SiI3132 is the really interesting addition because of what it brings to the consumer, and unless you're really on the ball most of this you may not know. As opposed to the legacy PCI-bus utilizing SiI3114 SATA RAID chipset, the newer Silicon Image SiI3132 model maintains a connection over a 2.5Gbps PCI Express x1 connection to the Southbridge. The Silicon Image SiI3132 also has Port Multiplier capability, so with the appropriate port multiplier hardware (not included) up to 30 HDDs can potentially be connected. These devices are just starting to break out onto the storage markets, so it's certainly forward looking.